Most kids, when they hear that, typically cringe. No one ever wants to be “like” their parents growing up. They’re old-fashioned stick-in-the-muds and oh, so often wrong, right? Not me. I’d hear that phrase and smile to myself. You see, Dad wasn’t my biological father. But for all intents and purposes, he was the only father I ever had. And he’s the one responsible for the camera in my hand today. But let me back up a bit. 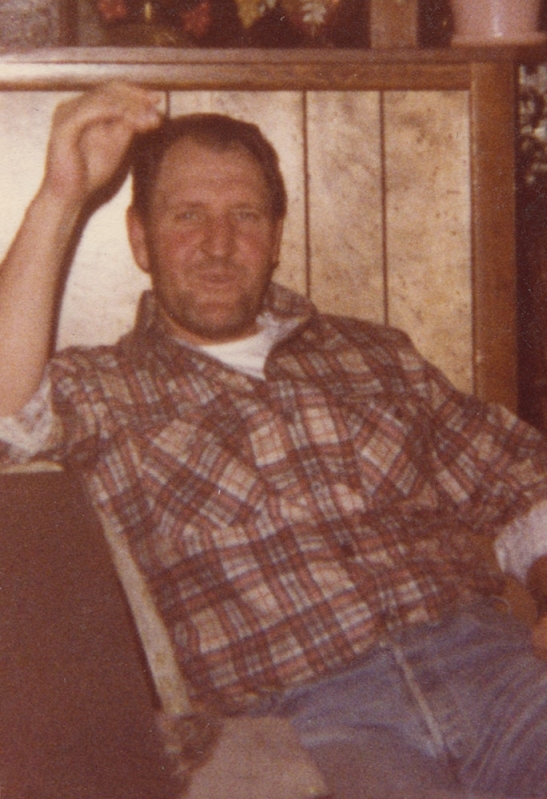 For those of you that don’t know, I lost my Dad this year after a horrible flood destroyed he and Mom’s house in May, then claimed him two weeks later. After the flood, my brother and his family, my nephews, and I all came together to help clean up the destruction. Seeing how broken my Dad was, as he surveyed the house he built that now lay in tatters, nearly broke my heart. One day after ripping up wet carpet, he and I sat together on the couch watching neighbors drop off food for everyone. He turned to me with misty eyes and said, “I never expected this…” Knowing how my Dad is about people helping him, considering he was a proud and strong man who seldom needed help – plus I’d only seen him cry maybe twice in my life – I wasn’t sure how he was going to finish the sentence. “I never expected people to be so kind.” It gave me a lump in my throat. We all worked diligently trying to clean up the mess to a point they could begin rebuilding, then went back to our respective homes. A week later, Mom called. Dad was in the hospital, she needed someone to come help with Nanny (my 91-year-old Grandma with Alzheimer’s who lives with them). I drove down to the hospital in Arkansas, arrived around 4 a.m. and saw Dad. He grabbed my hand and said, “Oh, Sherry, pray for me.” I said I would. Mom whispered, “He wants you to pray for him now.” So I took his hand and we prayed. That was the last time I spoke to my Dad. One week later, the flood water infection that wracked his body took him. During those months spent in Arkansas, I learned a few stories I’d never heard before. I was nine-years-old when he and Mom were married. Mom told me I walked up to him and said, “So, what am I supposed to call you?” Dad replied, “Well, you can call me anything you like.” Mom said I looked at him for a moment and said, “I’d like to call you Dad.” She said he got the biggest smile on his face and said that was okay with him. You know, I never realized it until now, but Dad chose to be my father. He didn’t have to. Sure, he married my Mom knowing she had two kids. But he could have chosen to just be a step-dad as some step-parents do, never truly connecting. But he didn’t. He wanted to be our Dad. So he legally adopted my brother and I, giving us his last name. It was a conscious choice on his part to not only love our Mom, but to love us as well. Don’t get me wrong. It wasn’t always roses with me and Dad. We fought like crazy. I probably was mad at him more than anyone in the family half the time. We butted heads a lot. They say the things you don’t like in other people are really the things you see and don’t like in yourself. Well, I always thought Dad was arrogant, stubborn, and a know-it-all. The only difference between me and Dad? He really DID know it all! I only wish I did. 🙂 There wasn’t a time he couldn’t tell me what was wrong with my car, even with my pathetic explanations of “…it’s doing this and sounds like that, Dad…” There wasn’t a thing he couldn’t build or piece of equipment he couldn’t fix. I always knew, if I couldn’t figure it out, Dad was only a phone call away and he’d know. And he did. When we were gathering photos together for Dad’s funeral, we couldn’t find any of me and the family. Mom said I always wanted to take the pictures, so there really are very few, if any, photos of me with the family other than formal portraits. 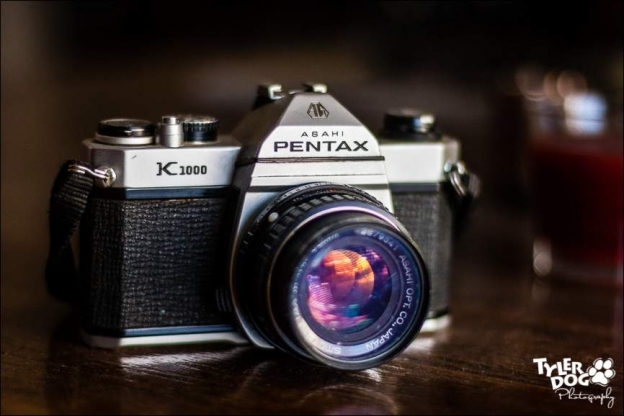 When I turned 18, getting ready for college, Dad bought me my first SLR camera, a Pentax K1000. He told me, “Well, kid, you’re pretty good with that thing, so maybe you’ll make some money.” Who knew that 32 years later I’d still be doing what I love and yep, I still have that old Pentax K1000. Dad was the one who got me started and I’ve never looked back. Every time I click the shutter and an animal is adopted because of the photo, Dad is there “saving lives, one photo at a time.” His portrait above is one of the very first I took with one of those old plastic film cameras. You know, there’s no way I could ever repay the kindness he showed me through the years. He was tough on me, but it was because he wanted me to do better, be better. He never believed in doing something halfway. He’d always say, “If you’re going to do it, do it right.” Might make for a little OCD in my life, but at least the things I do are done with all my heart, all my soul, and all my passion. Because I truly believe if it’s worth doing, do it with everything you have. It may not be the best, but it will be your best, and that’s all that matters. So, thank you, Dad. Thank you for choosing me as your kid and getting me started doing what I love. I have the Macy’s Thanksgiving Day Parade on for you and I’ll make sure the dressing is a little dry. I love you.